If you haven't spoken to audiences a lot, chances are you need to work on it. It can be one of the most terrifying things that some people ever try to do in life. One of the best people I've ever seen on a mic is my partner at Pedal Note Media, Lance LaDuke. Here is a piece that Lance did a long time ago that he has let me republish here. Good stuff! 2. WHAT ARE YOU PLAYING? This may be obvious but it still bears mentioning.The only way to get good at doing anything is by doing it. All performers must go out of their way to get as much performance experience as possible. And the key is to create your own performance opportunities. Don't wait for them to come to you! Approach 20 different venues where you live and ask them if you can perform there. Nursing homes. Schools. Coffee houses. Bars. Senior centers. What's the worst thing that can happen to you? You get 20 no's. Is that really that bad? I've found that being willing to potentially get "rejected" 20 times is one of the key traits that just about every person who has "made it" in the music business share. If you are in need of more performance experience, I challenge you to reach out to someone about about finding a performance space today. Don't wait until tomorrow or next week. Send the email. Pick up the phone. Text someone. No one ever acquired something like performance experience by thinking about it. I recently stumbled onto a great list of playing tips over at the website for the International Horn Society by Eldon Matlick, professor of horn at the University of Oklahoma. It is titled "Hot Tips for Horn Players" but is really a list for all musicians. It features 18 tips for musicians of all kinds. Really, really good stuff! 1. PERFORMANCE IS 90% MENTAL! Learn how to think! If you can hear it, you can play it. Expose yourself to great music and music making. Listen to great horn players. Experience live professional music making. Listen to recordings of world- class ensembles. Experience various mediums and styles of music. Become a musical sponge and take everything in. Every musical experience goes into your memory bank and this is the source from which you draw. 6. LEARN TO HEAR DETAILS IN YOUR PLAYING! Don’t succumb to the trap of falling in love with your playing. Develop a critical ear. When you think something is polished, record yourself. You will be amazed at what you hear. Keep stock of what you can do well and what you need to accomplish. Don’t waste time doing things that are not a problem. Great players work out and solve their playing deficiencies. Eliminate weaknesses in your playing. While this may prove to be mentally painful, this is a sure-fire method of gaining success in your performance. 12. PRACTICE ‘OUTSIDE THE BOX’ Musicianship is not the same as horn playing. Create a musical experience when you play. To this end, we must free ourselves from the instrument. Learn to sing! Singing is the ideal medium for establishing musical flow and the identification of logical breathing spots. Identify the natural flow of the solo line. Is the phrase asking a question or making a statement? As you sing, are you aware of the various emotional content of the various passages/sections? Practice singing and phrasing different ways. Identify those phrasings that have promise and then experiment on your instrument. When learning a solo, don’t neglect learning, and being able to sing, all interludes between solo entrances. Seriously, go read them all! "Many players see a low dynamic marking on a part and let that turn them into apologetic, frightened musicians. I think it is beneficial to do the exact opposite. " The above is a quote from a fantastic article by Weston Sprott that he posted on his website. It is only two paragraphs long and well worth the 30 seconds. As the title of the article says, don't be shy! And don't miss the awesome conversation we had with Weston on The Brass Junkies. It will get you thinking about some really important stuff. Tonight I saw a wonderful recital by the Seraph Brass here in the Washington, DC area. The playing was fantastic and the program was enjoyable. There was one thing that occurred during the performance that was a valuable lesson for us all. During the great Jack Gale arrangement of Porgy and Bess (which was recorded by the Empire Brass way back when) Amy McCabe, trumpet player for one of the premier military bands, had a little bit of an issue that she said I could feel free to share here. And it had absolutely nothing to do with her stunning playing! During a fermata she leaned over to quickly pick up her plunger mute and her tuning slide fell out right onto the floor! She smiled as it took her about five seconds to get the thing back in. Five seconds of dead time on stage feels like an eternity. Amy handled this like the pro she is. She didn't panic. She didn't get even remotely upset. She even turned to the audience right after the tuning slide was back in and said "Well alright!" Everyone laughed and she actually created a real bonding moment between the performers and the audience. It was the absolute perfect response to the situation when many of us would have become upset. She kept the audience in mind above everything else which is the only thing that matters. Your instrument is dumb. It doesn't know a half step from a hamster. We need to be sure to be issuing commands and not be getting feedback from our instruments while we play. Exclamation points, not question marks. "No amount of anxiety makes any difference to anything that is going to happen." Anxiety about a concert, a job interview, or anything else is never going to help make it go any better. I always find that when my mind wanders and starts to act against my best interests that it helps for me to focus on things that I can control. Two things that I can't control: the past and the future. Even if I know deep down that I should have prepared more for something, worrying about that now will not help anything. Even if I am being reasonable in expecting bad news in the near future, worrying about that will always distract me from taking the next positive step. For some it is meditation, for some it is prayer, for others it is listening to their favorite music. Find whatever it is that gets you focused on the here and now and you will be amazed at how it puts you in the best possible position to succeed. 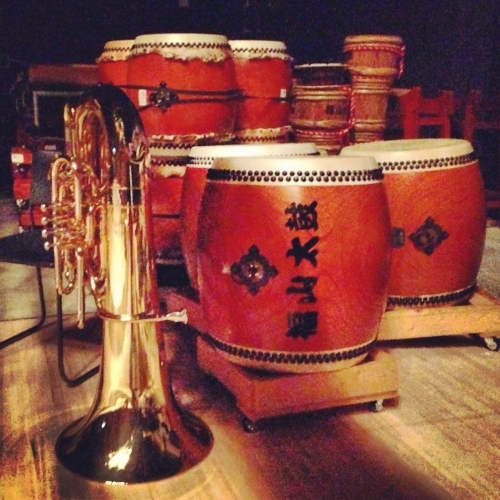 My tuba backstage next to some taiko drums before a Boston Brass performance in the mountain town of Yuzawa in the Niigata Prefecture of Japan. "People have short attention spans, Google Generation. On the long notes I'm going to insist that you keep us with you." Long notes are just as vital to the musical story you are trying to tell as the short ones. There is a way to play long notes such that not only your audience but also the people playing along with you know exactly where you are headed musically, where you are coming from musically, and exactly when that note is going to end. Keep us (the audience and your fellow performers) with you on the long notes at all costs. "The place that you want to get with your playing is to where you are uncomfortable with how far you've gone." The only way to tell if you are playing a passage too loud is to play the passage too loud. If you are practicing, the only true way to evaluate the sounds you are making is by recording yourself and then listening to the recording. Whenever students begin studying with me, almost to a person they are uncomfortable at first with how far I ask them to take things like dynamics and accents. You don't know how much dynamic contrast is too much dynamic contrast until you have captured yourself playing with too much contrast via a recording. When I first joined Boston Brass I regularly found that I was uncomfortable with what I was hearing on my side of the bell, especially concerning the amount of front to the notes and accents. But when I listened back, I found that I was simply matching Rich Kelley on the trumpet or JD Shaw on the horn. The proof was in the recording and it turned out that my comfort level as it related to what I heard on my side of the bell was not only not relevant but had to be actively ignored in my pursuit of simply "making it sound right." What in your playing do you need to take too far?